When I first heard this recipe I didn't quite believe it. Only 3 ingredients and they actually taste like Butterfingers? No way! That is not even possible! Then I listened to the ingredients: candy corn, peanut butter and chocolate chips. Now that is too intriguing not to try! Right? 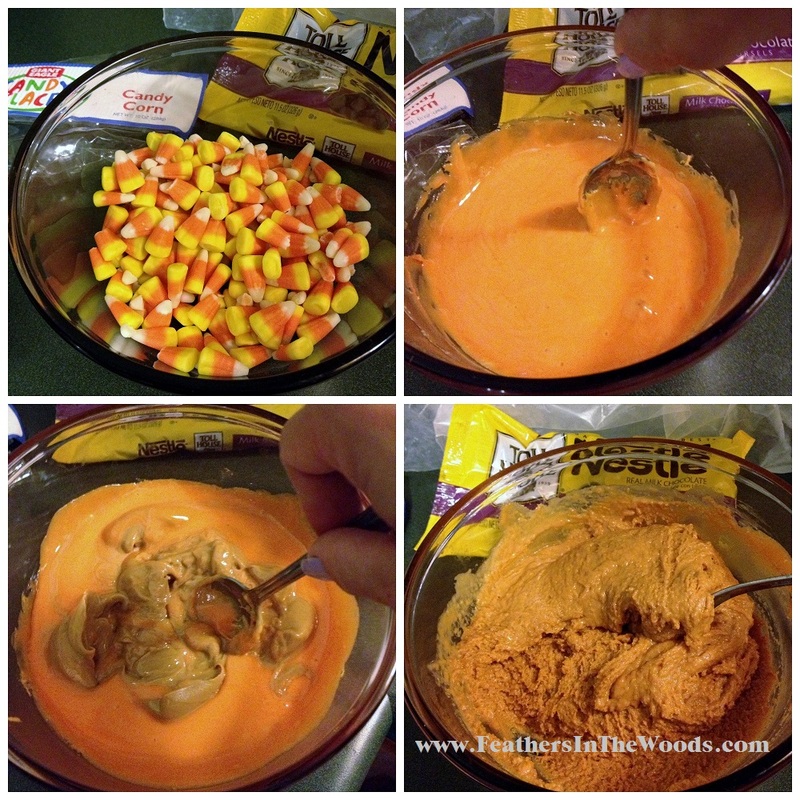 The recipe went like this: 1 bag of candy corn, the equivalent in peanut butter and enough chocolate to cover it. Simple enough, right? So for this experiment I'll need to introduce you to my upstairs kitchen where the microwave is. I have 2 kitchens...one on each floor (don't blame me I didn't build them!) lol Actually it gets weirder.....there is no stove upstairs and when we bought the house, there was no refrigerator downstairs. We fixed that with a kitchen overhaul downstairs but the upstairs is still only 1/2 kitchen. Perfect for microwave recipes though! 1) Pour the candy corn in a microwave safe bowl. Microwave in 30 second intervals stirring between until completely melted. 2) Add peanut butter, blend thoroughly. If you need to microwave it a little more to blend completely, do it in 10 second intervals. 3) Pour into wax paper lined pan. Place in freezer for 5-10 minutes. 4) Take out of freezer and remove from pan by lifting the waxed paper. 5) Cut into bars using a pizza cutter. 6) Melt the chocolate in a microwave safe bowl. (Make sure your bowl is completely dry to begin with, even a hint of moisture can ruin chocolate turning it grainy.) Microwave in 30 second intervals until smooth, stirring in between. Be careful not to scorch the chocolate! 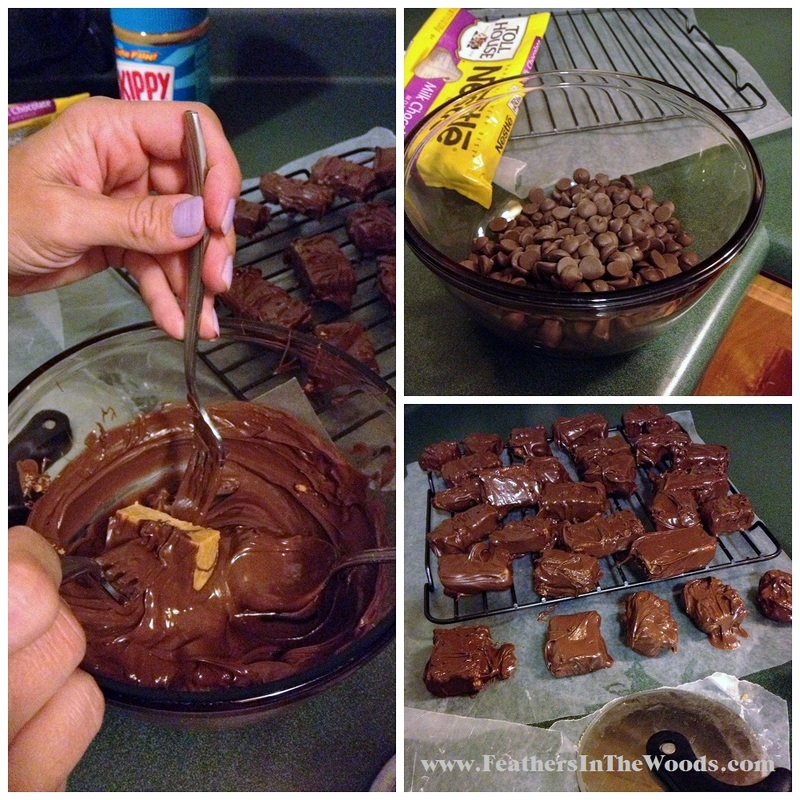 7) Using 2 forks dip the bars in the chocolate, turning to coat them. 8) Place on either a piece of wax paper, or a cooling rack to dry. 9) Allow the chocolate to harden and you're done! They have a soft consistency when left on the counter. 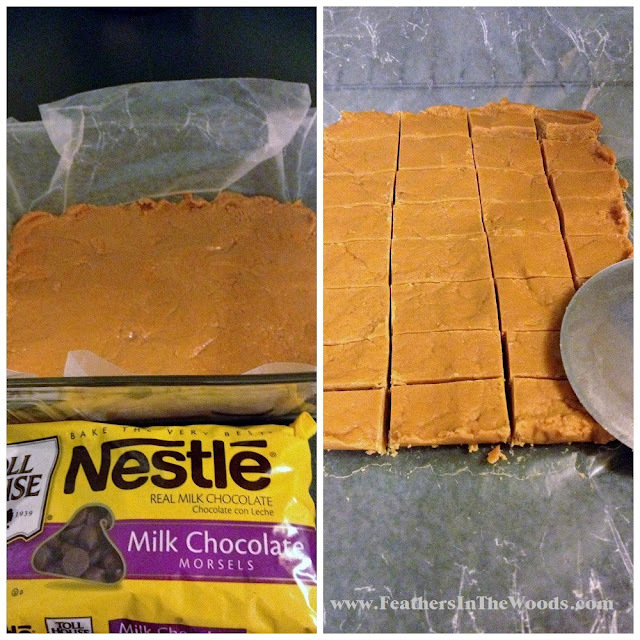 For a more crunchy Butterfinger-like texture, store in refrigerator. I love recipes like this. Not only was it easy to make, but ingredients like these keep well and I can always find them on sale. When I add a coupon to the sale I get them super-duper cheap. This ended up being a $4 recipe, but would have been cheaper had it been candy corn season. Let's talk about that. The recipe called for an equivalent of the 2 ingredients. So this Halloween when candy corn is in all the stores in 16oz bags, you can use 1 bag of candy corn and 1 16 oz jar of peanut butter. Most jars are 16 oz....but I do have an 18oz in my cupboard and I've seen 12oz at the dollar stores...so read your labels or measure. If you really decide you love them then maybe a 2lb bag of candy corn is in your future....just don't blame me for your cavities! Try it! You'll be amazed how easy and yummy they are! These sound really great. And your house does seem to have an odd setup. Hope you have a great day. They are yummy! The house is odd, but I've grown used to cooking on 2 floors. lol Thanks for stopping over! Wow! These sound awesome! Pinning! Thanks for the pin. I added you on google+ and bloglovin and FB lol Love your blog! I had no idea that it was possible to melt candy corn! These look so delicious. I am definitely pinning this. Oh my gosh-these look amazing and so easy! I don't know whether that's a good thing or not, as I could eat my weight in Butterfingers! But thanks for sharing at Fridays Unfolded! Just pinned to the links board! What a fabulous way to make Butterfingers! Thanks for sharing with SYC. I want to try these! Not sure we can still get candy corn in the store! I hope so! Pinned! You should be able to find it. My store has it in the regular candy aisle year round. Good luck! oh gosh, I think we're going to try this! Thanks so much for sharing with us at Simple Lives Thursday; hope to see you again this week.